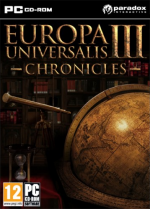 The Europa Universalis 3 encyclopedia that anyone can edit. Europa Universalis III is a grand strategy computer game by Paradox Interactive, covering a period of time from 1399 to 1821. Players can choose from 313 nations to play, and the game has significant differences from Europa Universalis II. Anyone can contribute to the wiki. If you want to become a contributor please consider registering (though you can also edit anonymously), and start editing! If you spot anything in need of improvement, don't hesitate to make an edit. Strategy - Guides and strategies for the game. Reference - Detailed information about game mechanics. Countries - Strategy guides specific to different nations. Mods - A list of playable EU3 Mods. Modding - Tips, tricks, and utilities for creating modifications.